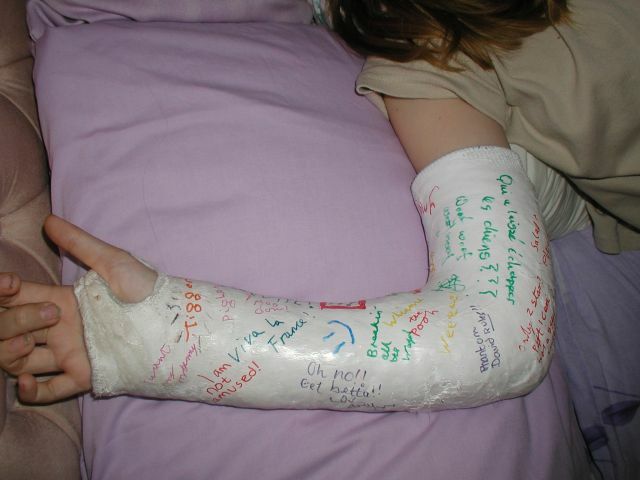 Ceri-Siân's plaster upon her return from her skool's trip to Paris. 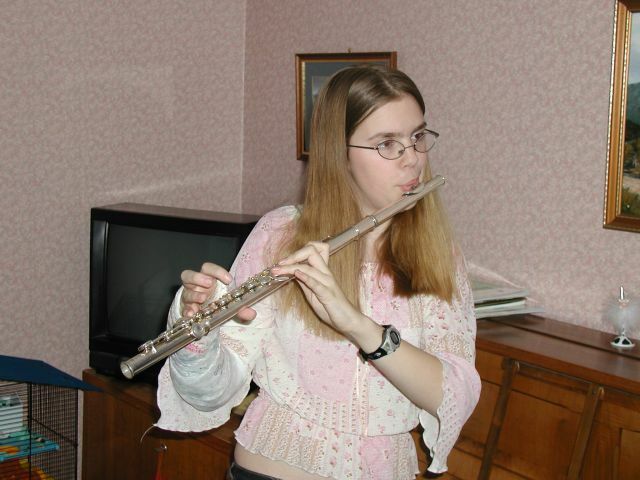 Ceri-Siân proving you can play the flute with a full length arm plaster. 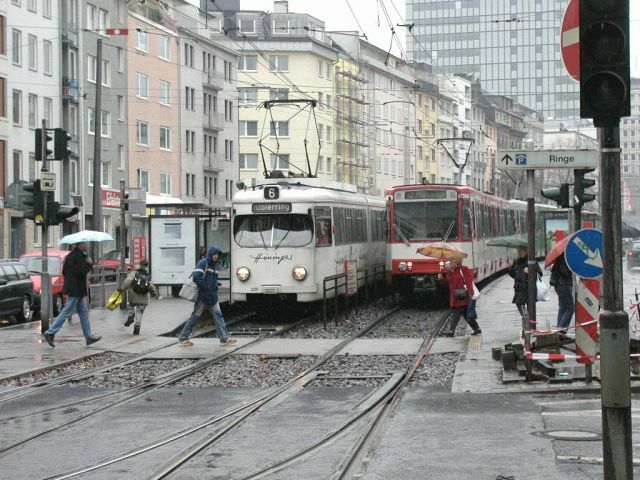 In March I had a day trip to Köln, making use of a £2 each way fare including taxes. As you can see, the weather was a bit wet! Ann and our friends daughter Helen just before her 3rd birthday. 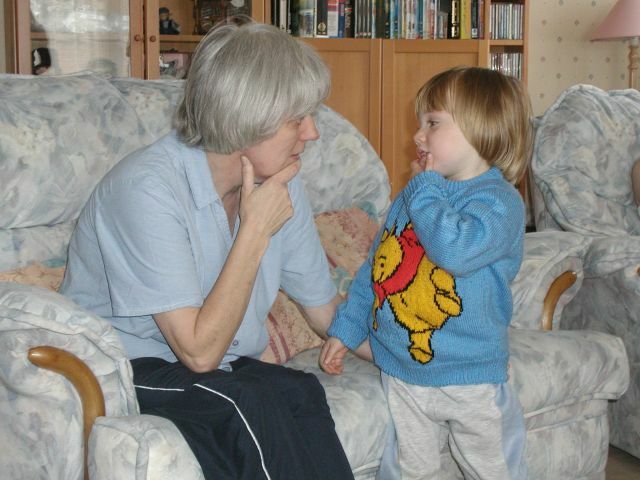 She is wearing a Winnee the Pooh jumper that I had knitted her. In May I went to Lisboa for work, armed with my digital camera, which I lost on my return journey. 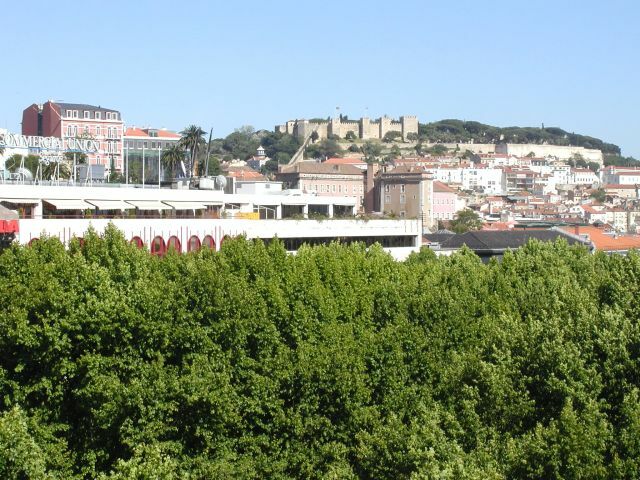 The view from my hotel room in Lisboa. The first destination of our French trip was the Chemin de fer de la Baie de Somme. This a preserved metre gauge system in Picardie. 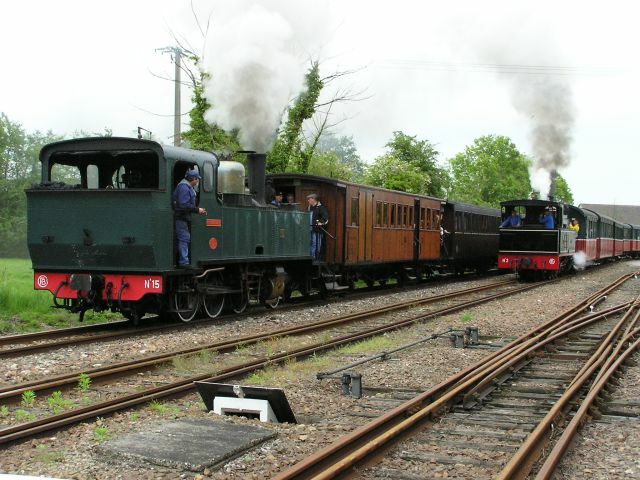 At the weekend it is possible to see simultaneous departure of steam trains. Note also the mixed gauge, gauntleted track. 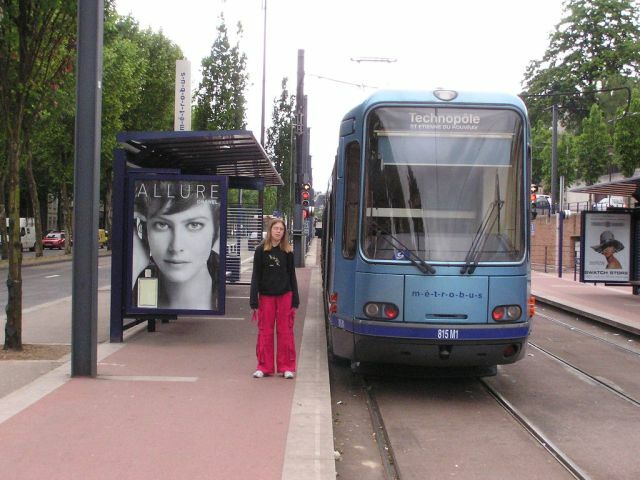 In Rouen, capital of Normandie, surprise surprise we found a tram system! 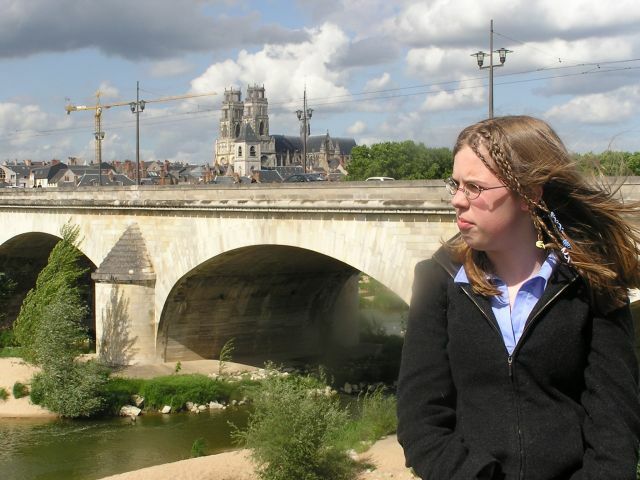 Ceri-Siân posing as the "Maid of Orléans, on the banks of the Loire, at Orléans. It would be no surprise to you to find out that a tram line goes across the bridge! In the background is the Sainte Croix cathedral. Spring Bank holiday week we went to the Tandem Club International Rally at Moyaux in Normandie. 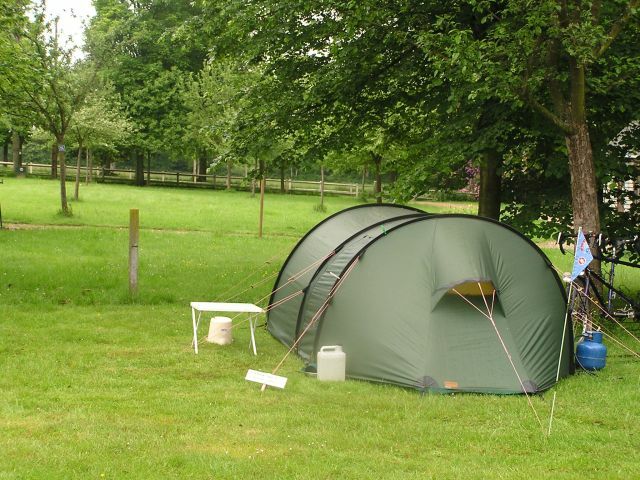 We got there early and campsite was empty! After a few days the campsite was full. 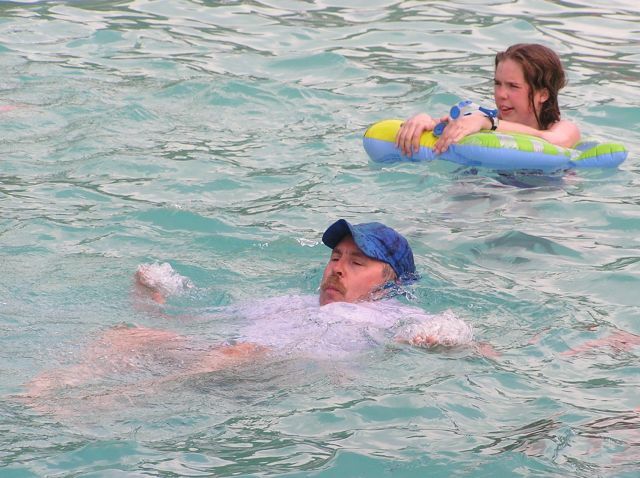 Ceri-Siân in the pool at Moyaux with her dad taking a Shepshed bath and laundry after he was pushed in by Chris Bowen. 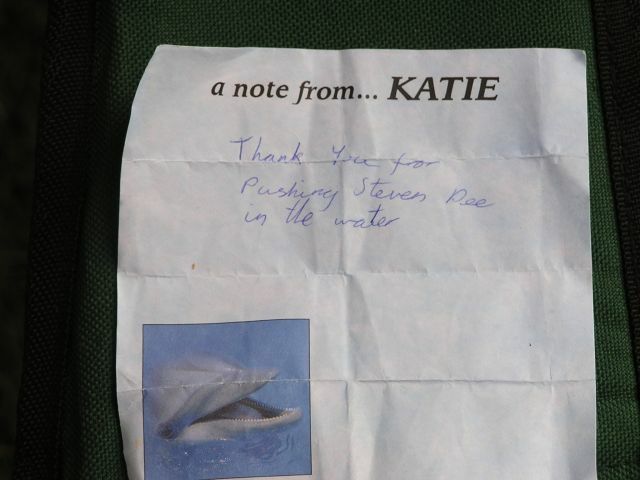 Chris's daughter Katie thought it is was great that her dad pushed me in the pool, so she sent him a thank you note!. 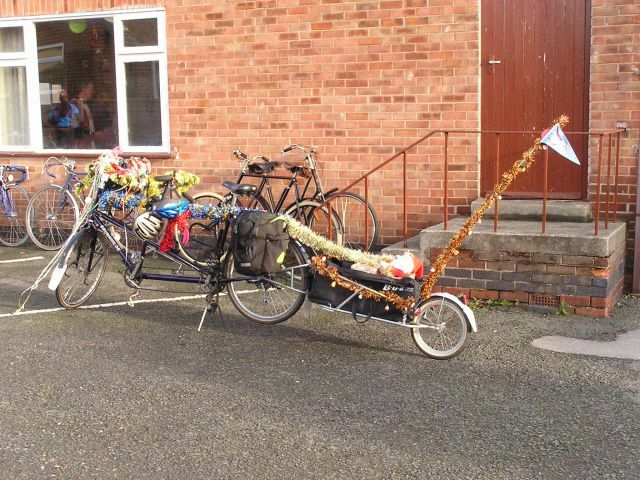 In June we went cycle camping on the triplet with our friends the Jeffery's to Quorn. On the Saturday at Quorn the furthest we rode was to Tesco's in Loughborough so the kids could get the latest Harry Potter book. Here is Ceri-Siân reading by torch light. In June sister Joy remarried and became a "Strange woman". 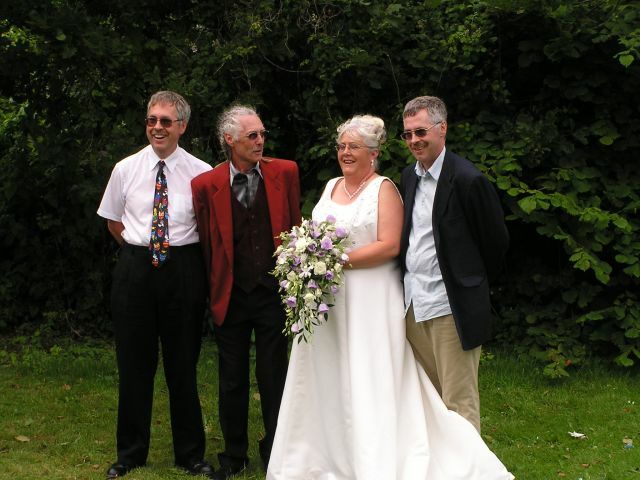 Here is the happy bride surrounded by her brothers, myself, Len, sister Joy and Philip. 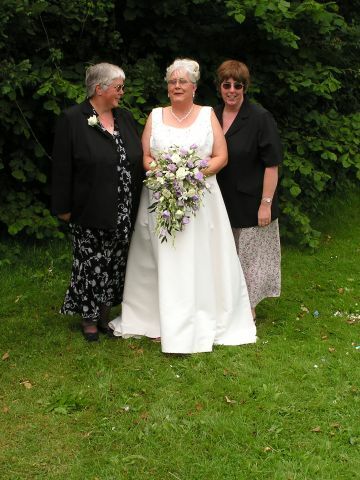 Just to complete the family picture, here are my three sisters together, Liz, Joy and Grace (aka Scraggy Neck). 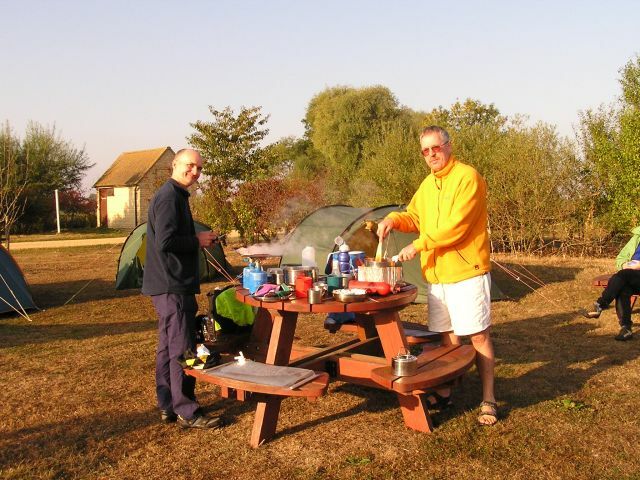 In July we went cycle camping with our friends near Oxford, to Days Lock on the Thames. 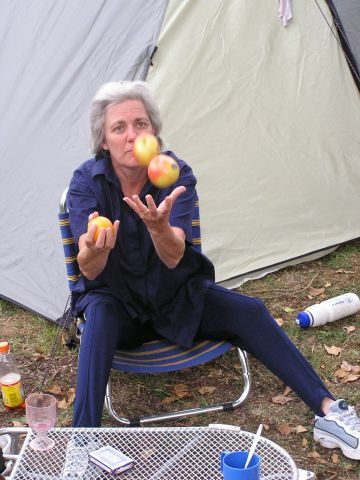 Ann took the opportunity to practice juggling with 3 apples. This later turned to playing catch with with Ceri-Siân. 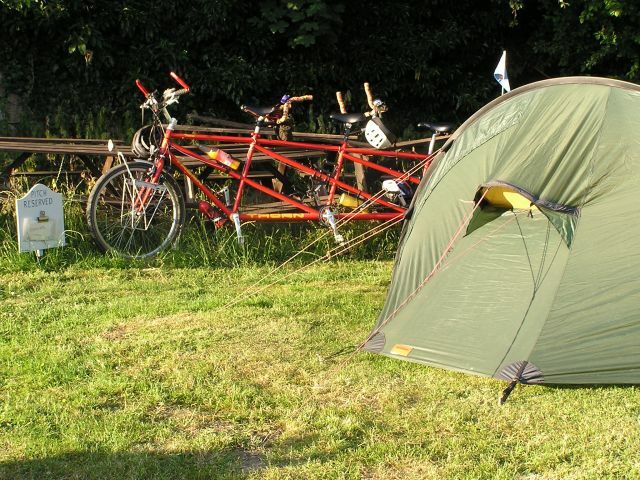 In August we went to the Tandem Club Rally, at Longstone Hall, near Bakewell in the Peak District. We took Melisa, Ceri-Siân's cousin with us and rode/pushed the triplet. 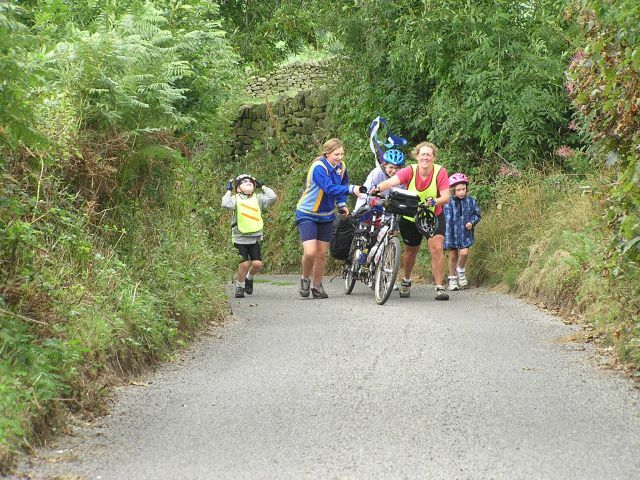 This view shows Melisa and Ceri-Siân helping Jane Sherwood push her triplet up a hill whilst her two Tom and Libby enjoy the walk. After climbing all those hills, time for a rest and sunbathe. Melisa, Ceri-Siân, Libby and Libby's teddy all lined up enjoying the sun. 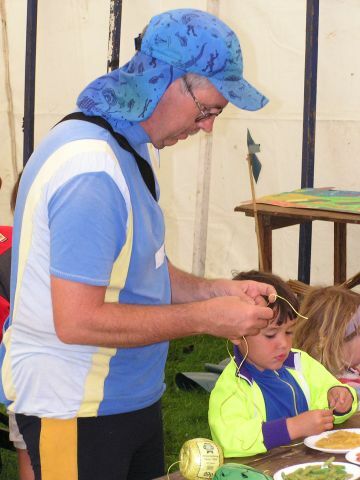 It has become a tradition at Tandem club rallies for a morning kids club. It has also become tradition that a certain big kid joins in rather then helps. Here I am making Ann a pasta necklace. They had a rest day and the kids went and did a team exercise on the Adventure playground at Longstone Hall. The girls were teamed up against the boys. There was a bit of cheating going on on both sides. 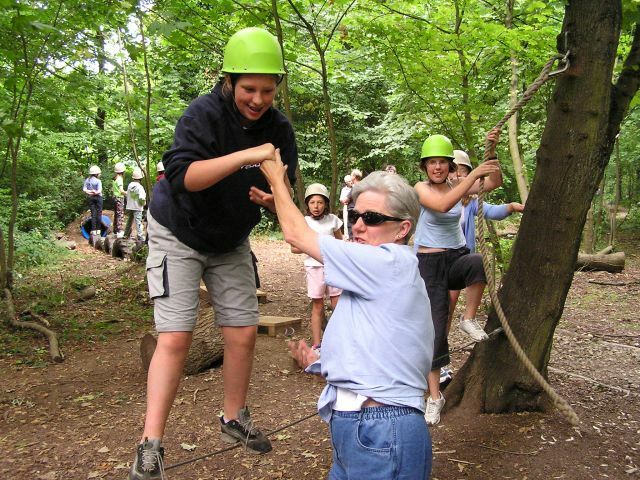 Here is Ann giving Melisa a hand, Ceri-Siân who was next got the same help. "Ok who farted in the tunnel". 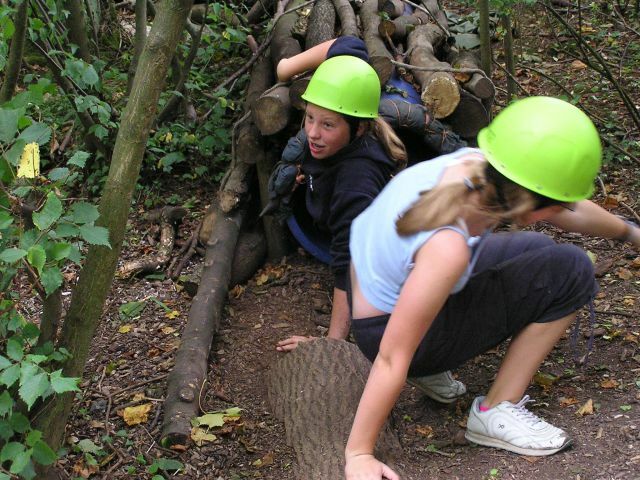 Ceri-Siân and Melisa making a rapid escape from the tunnel! 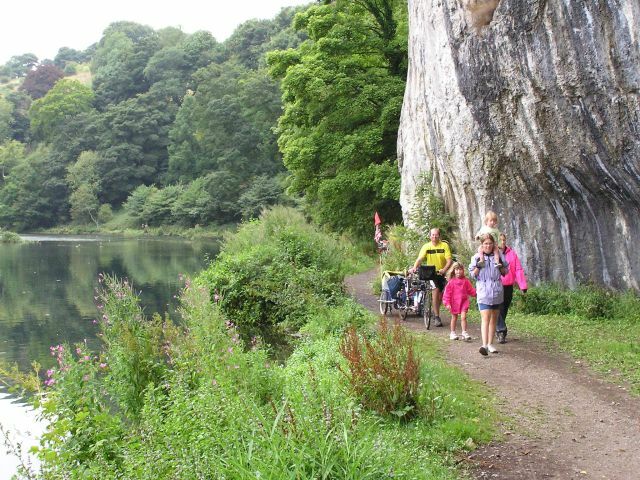 Walking with our bikes along the footpath in Millers Dale. 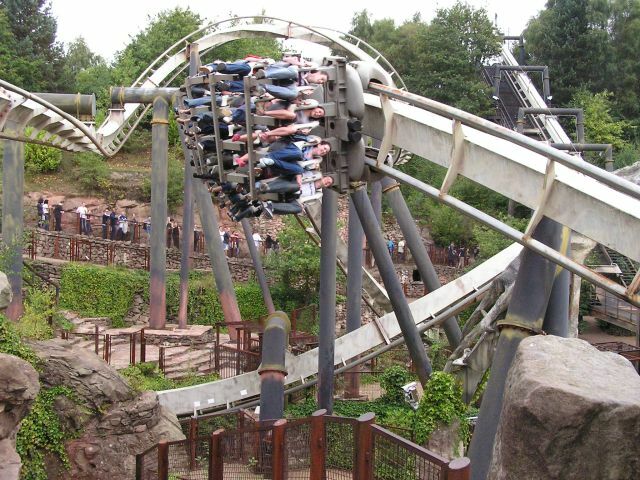 In September I went with work to Alton Tower on a "thank you" event for a project I have been involved with for 7 years. This is "Air", I went on and got an industrial injury! After I got off I developed a limp, I presume to G force pressure on my hip. I got no sympathy at work the next day! 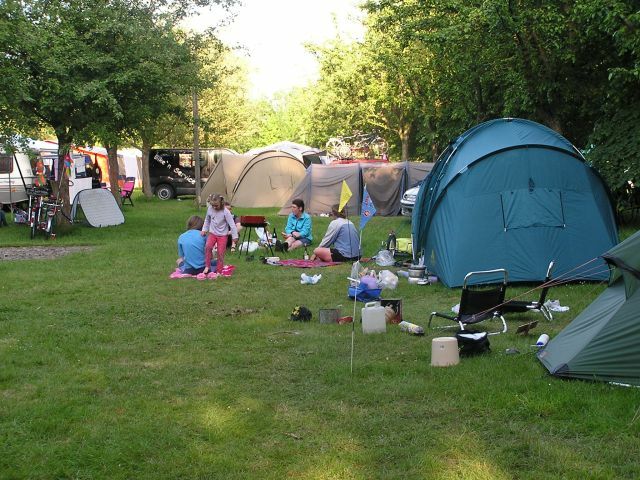 The last weekend in September we did our final camp of the year at Rushey Lock on the River Thames. 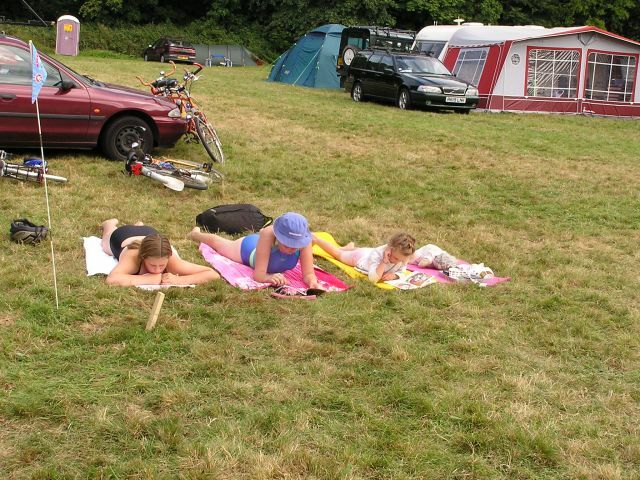 We cycle camped with our friends the Jeffery family from their house near Oxford. 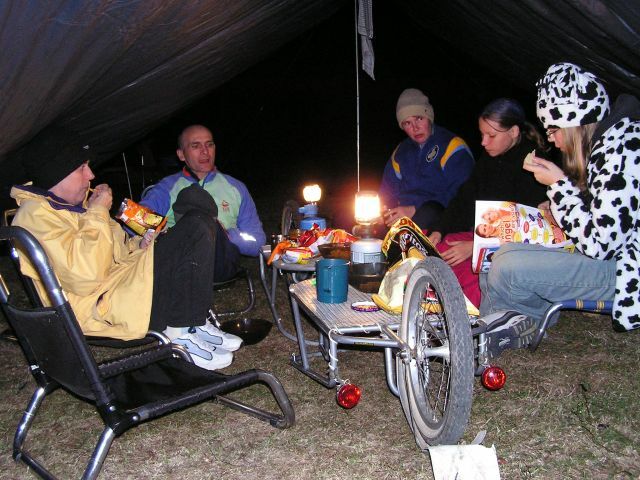 Saturday evening sitting around the traditional cycle camping tables, upturned BOB yaks. Ann, Philip, Caroline, Stephanie and Ceri-Siân. A tired Ceri-Siân giving her dad a cuddle. 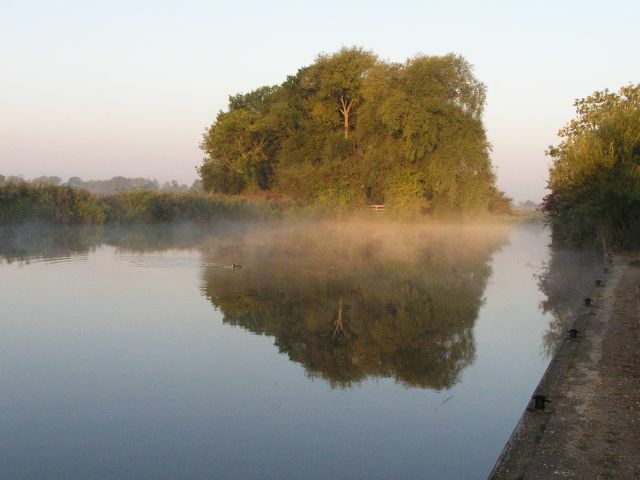 Being the end of September with glorious weather, we paid for it a bit with an early morning frost and mist. The view from our campsite. Philip and I cooking breakfast. 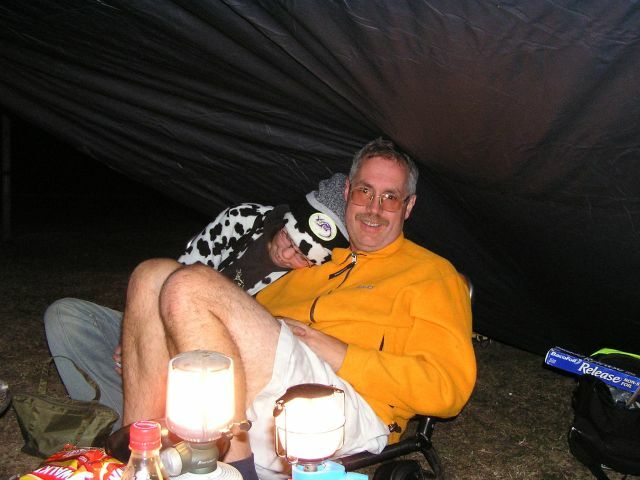 We use a petrol driven dragonfly stove, the Jeffery's prefer gas. 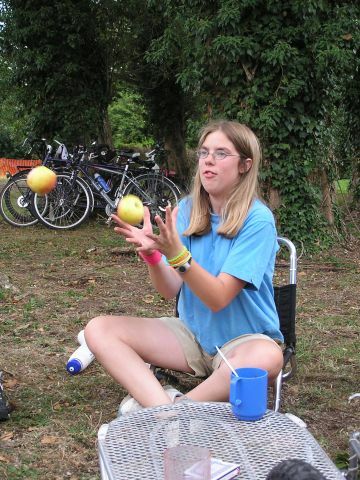 At the end of October Ceri-Siân took part in a local Baden Powell challenge. 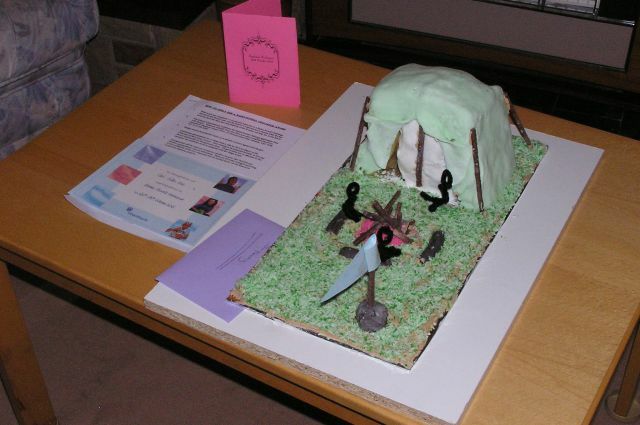 She and her friend Amy made a thank you cake for her guide leader after the challenge. 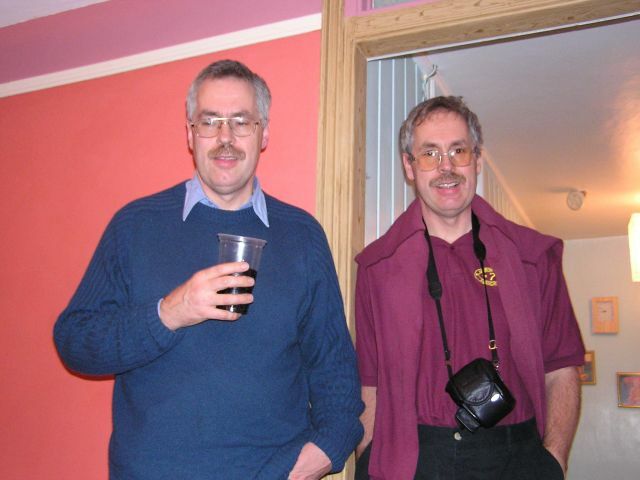 A rare photo of the "twins" together. Do you know which is which? Brünnhilde our tandem had a facelift in the autumn. Belton mince pie run was her first outing following it. Here she is with Yasmine our yak decorated in our traditional style.